By Beth Allgood On this International Day of Happiness, we celebrate the United Nation's goal of prioritizing happiness in the agendas of its 193 member countries. The United Nations created the March 20 celebration in 2012 to recognize the importance of happiness and well being as universal goals, especially when creating public policy. This year, the UN is marking the day by creating a "happy playlist" so that people can share music that makes them happy. Although a fun activity to brighten your day, it is also part of a growing conversation asking how to measure happiness and well being. Traditionally, a nation's progress is measured by its Gross Domestic Product (GDP), which analyzes only economic activity – driving policy though not necessarily contributing to personal contentment. Secretary General Ban Ki-moon explained that the world "needs a new economic paradigm that recognizes the parity between the three pillars of sustainable development – social, economic and environmental well-being. Together they define gross global happiness." How can we measure social, economic, and environmental well-being? 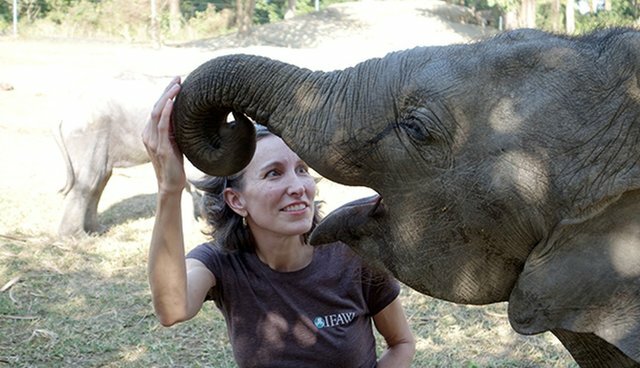 To answer that question, the UN is encouraging the exploration of what in our lives and habits make us truly happy and, for many of us here at IFAW, animals make us truly happy. Pet owners exhibit greater self-esteem, are less lonely, and have healthier relationship styles than non-owners. Educational visits to nature and wildlife reserves can improve students' confidence and self-esteem and learning skills. A 2009 ethnographic study of wildlife tourism revealed that wildlife encounters initiated an emotional response of awe, wonder and privilege, provoking a "deep sense of well-being that transcends the initial encounter leading to spiritual fulfillment and psychological health benefits." IFAW is part of this growing conversation not only to encourage environmental and social metrics in a new universal measure, but also to correct the bias that prioritizes economic growth over sustainable environmental and equitable social policy objectives. By the next International Day of Happiness, we could find ourselves measuring the strength of a nation by environmental and social well-being rather than by only economic activity. Having a job I love where I get to promote policies that protect animals makes me happy. Sometimes I even get to interact with them like I did in January in India at the IFAW / Wildlife Trust of India Center for Wildlife Rehabilitation and Conservation. I visited India to present a paper on the link between animal welfare and human happiness and wellbeing, and then got to experience it firsthand. A song that makes both me and my daughter happy is "Stray Cat Strut." What song with an animal in the title makes you happy?